There is a high global awareness of BYOID. BYOID deployment using social IDs is still in its infancy, but interest is high, especially for mobile and web customer populations. Ownership of digital identities is dispersed throughout organization. The most common BYOID use case involves making registration easier for users. 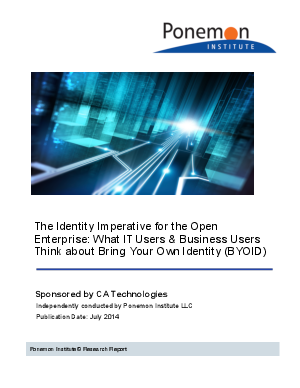 IT users and business users have divergent reasons for valuing and adopting BYOID. BYOID benefits of most interest to the organization. This survey provides information on the level of interest in BYOID that IT users and Business Users have.